The Flea Market Micro Handheld Arcade Game is sort of cheap, but it left me anything but cheerful. As most of you probably know, I’m a bit of a sucker for retro gaming in general. 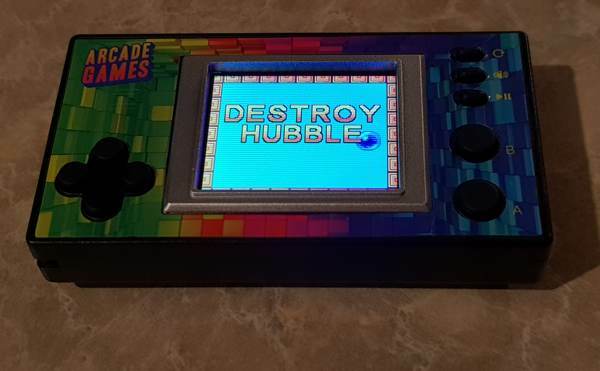 JB HiFi has been selling the Flea Market Micro Handheld Arcade Game for a while now at around $25, and to be honest, I’d looked at it, dismissed it and walked past plenty of times. The other day, though, it caught my eye, and I thought, well… why not? I probably should have listened to the “not” part of my brain here. That’s because the very short form of it all is that the Flea Market Micro Handheld Arcade Game is pretty woeful on just about every front. 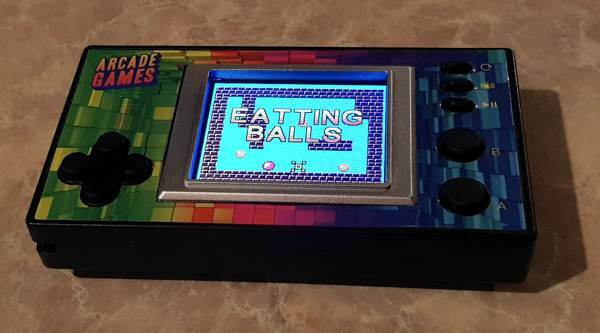 The Flea Market Micro Handheld Arcade Game is technically a simple enough device, with a 1.8 inch LCD display, four way directional pad and two primary game buttons, along with play, volume and power buttons. Build quality on the Flea Market Micro Handheld Arcade Game can’t be described as anything but “cheap”, but what do you expect for $25? There’s probably some kind of smutty joke to be had here, but clearly I’m too classy for that kind of thing. The drawcard for the Flea Market Micro Handheld Arcade Game has to be the promise of 150 built-in games. That did rather intrigue me. I’ve reviewed a few dodgy portable handhelds in the past, such as the RS-8 Game Player or the Digital Dragon System GB-150, both of which were rubbish famiclones in that classic rubbish famiclone style. Given that JB Hi-Fi stocks and sells plenty of official Nintendo kit, I didn’t figure that the Flea Market Micro Handheld Arcade Game would be a famiclone to speak of. What did the poor telescope do to deserve this? And indeed, it isn’t. Instead, what you get are 150… ish… pretty poor flash games. OK, they’re probably not running actual flash code, but they play exactly like those woeful browser-type games that you get on free Flash game sites, just on a much smaller screen and with generally worse controls. 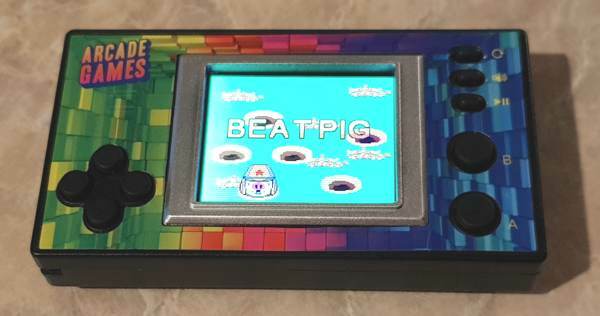 I will give the Flea Market Micro Handheld Arcade Game one plaudit, and it’s for the bizarre creativity that’s gone into naming its games. I can’t quite decide if they’re just bland and poor translations, or if there was some kind of AI that was force fed too many classic arcade and mobile game names and told to randomly assign them to games. The end results vary from the boring to the creatively amusing and then back again with a speed that’s quite astounding. Now, you may have noticed a few familiar names in there. Raiden! Bastion! Elevator Action! Circus Charlie! Clearly, they didn’t lie about the Flea Market Micro Handheld Arcade Game having “arcade” games, right? Well…. maybe not. 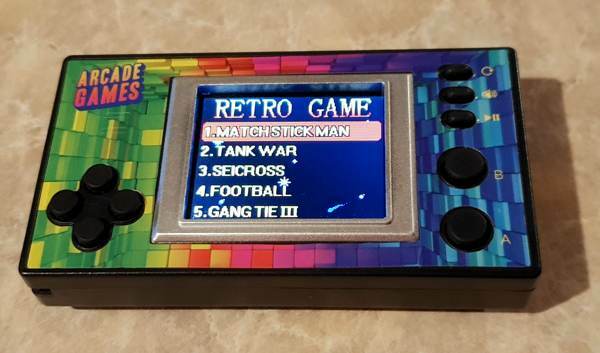 Actually, it’d be an interesting application of Australia’s truth in advertising laws, because while games with those names are present on theFlea Market Micro Handheld Arcade Game, they’re in no way the arcade originals. Some of them are nothing like the arcade originals. Mess with Elevator Action, and I WILL GO FULL JACK BAUER ON YOU. 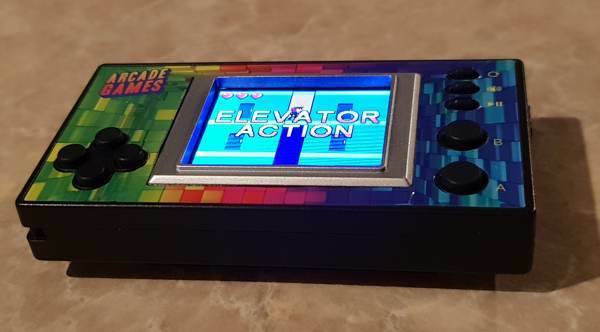 The “Elevator Action” on the Flea Market Micro Handheld Arcade Game plays like somebody describing a game of elevator action to you, only worse. Bullets sometimes hit, and they sometimes go through you or your foes. You don’t seem to be able to get into the red doors to pick up the secret files, and the whole thing runs at the speed of treacle anyway. Amongst the weird games, there’s still the same sense of monotony. Beer Waitress is of course Tapper, but it’s at the wrong pace and almost impossible as a result. 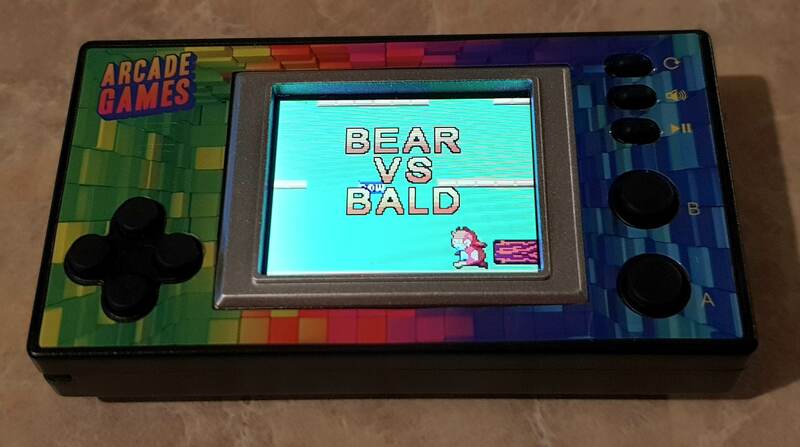 Want to have a guess as to what “Bear Vs Bald” is? Go on, have a go…. It’s a Mario Bros clone. Not Super Mario Bros, mind you, but instead Nintendo’s original single screen game. You’re a bear, and there are… moles, I guess… in cars that you have to flip. Are moles really bald? I’m probably overthinking it. Bear vs Bald. Again, there’s probably a joke about bears preferring things to be hairy here, but would I make that gag? I would not. Shoot Balls is, sadly, not a testicular aiming game, but instead an incredibly dull single screen balloon shooting game. Beat Pig is a classic bash-the-mole type game, except that the mole is (you guessed it) a pig. Also, it’s essentially impossible. Also, the Pig might just be wearing a communist hat. Given where this was almost certainly made, does this make the game political satire? Boldly Egg isn’t an egg-themed Star Trek game, but instead a non-moving Doodle Jump style game. 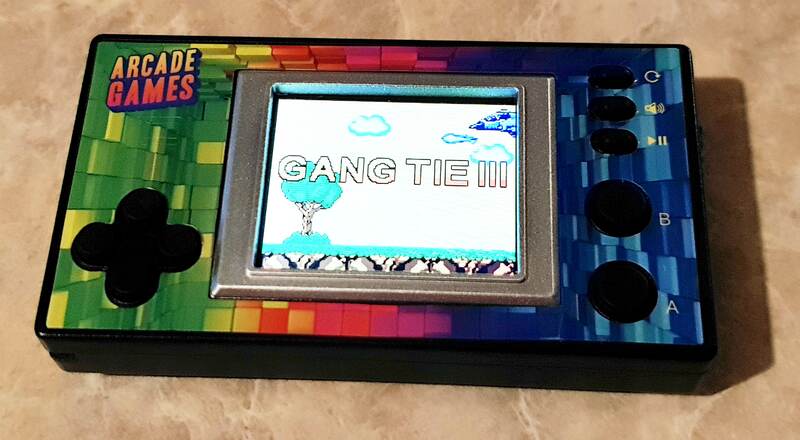 There are a lot of those, because while there are technically more than 150 games on theFlea Market Micro Handheld Arcade Game, there’s an incredible quantity of theme or concept repetition. Why do I have Gangtie III, and not Gangtie or Gangtie II? Why do I even care? It’s a bizarre Superman-esque sideways shooter, just in case that wasn’t obvious. Because of course it is! Personally, I’m hanging out for Gangtie IV: The Quest for Peace. I think you get the point by now. 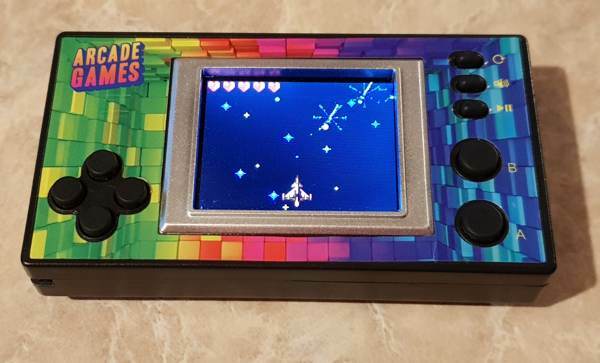 The Flea Market Micro Handheld Arcade Game is easier to get hold of in Australia thanks to JB Hi-Fi stocking it, and it’s not quite as copyright infringing as the many portable famiclones you can easily buy online. But that still doesn’t make it good, or for that matter playable. I’ve played plenty of bad games, and I’ve played plenty of basic games. Basic games can be fun. The classic score chase of the Game & Watch games can be a great way to while away a little time, and the continued success of casual mobile games shows that there’s still an audience for this kind of approach. But you have to at least provide essentially playable or interesting games! Avoid the Flea Market Micro Handheld Arcade Game, folks. I wish I had.